HEALTH MINISTER SIMON Harris has said that the State will pay for women who are concerned to have a repeat cervical screening in they wish following on from concerns about failures in the National Cervical Screening programme. Tweeting this evening, Harris said that many women had contacted him with concerns about smear tests. 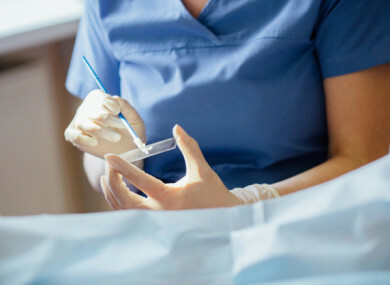 “Have heard from many women today who have had smear tests and would like a repeat test to reassure them,” Harris said. Am arranging for this facility to be available and the State will meet the cost of the repeat test. Arrangements on how this will operate will be outlined next week. Harris’s commitment comes after widespread concerns this week about failures in the National Cervical Screening programme. “The SIMT has sought a full review from the CervicalCheck programme of 206 cases whose cytology reviews suggested a different result from the original and that would have recommended an investigation to occur at an earlier stage,” the HSE said in its statement today. The issue followed on from one woman’s case - Vicky Phelan - being highlighted in court this week. Phelan, who’s a 43-year-old Limerick mother-of-two, was awarded €2.5 million over a missed abnormality in a smear test in 2011. Earlier, the HSE issued an apology after a helpline for women to ring in relation to concerns about past cervical checks was down for 90 minutes this morning due to a technical issue. Harris also acknowledged the problem, tweeting that it was the “last thing anyone needed”. The helpline was in operation yesterday and was set to open again at 9am this morning for women to contact with concerns. However, the technical glitch meant that it did not open until 10.30am. “The CervicalCheck Programme would like to apologise to those women who were trying to contact the helpline between 9am and 1030am,” the HSE said in a statement this afternoon. The service provider has earlier apologised to the CervicalCheck for this technical problem. The HSE said that the helpline received upwards of 700 calls yesterday. As of 1pm today it had received about 300 calls. Email “Simon Harris says the State will pay for women to have a repeat cervical screening”. Feedback on “Simon Harris says the State will pay for women to have a repeat cervical screening”.